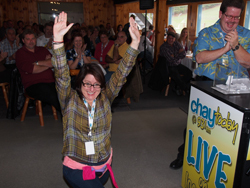 CHAY Today is a popular FM radio station broadcasting in central Ontario. Recently, Magnacom was asked to participate in a CHAY Today promotion, the “Jet Away Breakfast”. 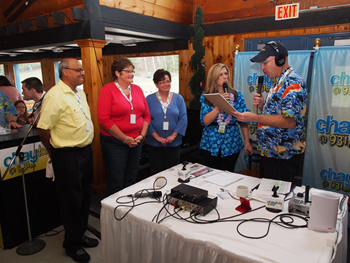 Radio listeners had the opportunity to call in for a chance to win a trip to Jamaica. Qualifiers first attended a breakfast where grand prize winners were selected. Magnacom, building on an existing relationship with CHAY Today, decided to participate in the breakfast. We not only ran a number of on-air spots helping to promote the breakfast, but we also contributed one of the most popular grand prizes. 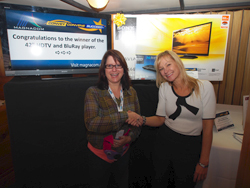 Andrea Murray from Barrie was the lucky winner of the Magnacom big screen HDTV and Blu-ray player. “This is fantastic! Now I just need to find a boyfriend to come over to hook this thing up!” said Andrea. 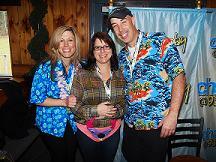 For the grand prize trip to Jamaica, breakfast attendees were asked to pick a suitcase. Whoever chose a suitcase with a model airplane in it, won the trip. This event is an example on how Magnacom supports the community, has fun and gets the word out about our video and event services. Future planning is under way to work with CHAY Today on other events in their broadcast market. These events will make use of our Convey and Convene services.